Chad today ordered the Qatari embassy in N’Djamena to close, accusing Qatar of trying to destabilise the country via Libya. It has given Qatari diplomats ten days to leave. The move follows an attack over the weekend on a Chadian army patrol on the Libyan border by a heavily armed militia that is believed to have been operating on the Libya side of the frontier. Several soldiers were reported killed. Numerous groups opposed to the regime of President Idriss Déby have used southern Libya as base for operations and he has regularly accused Libya of supporting the Chadian opposition and training it. In April this year, the Presidency Council’s foreign minister Mohamed Siala acknowledged that there were Chadian opposition in the south of Libya fighting as mercenaries. He put the number at 18,000. He also said there were another 6,000 from Sudan. Many of these, though, are reported to have been fighting alongside the Libya National Army led by Khalifa Hafter and to be doing so with the active encouragement of Déby. Others, though, are said to have supported Misrata’s Third Force when it was in the south as well as pro-Islamist fighters there. With events in Libya dominating government thinking in N’Djamena, because of the armed opposition’s use of it as a base, Déby is again cultivating relations with Libyan political and tribal leaders. 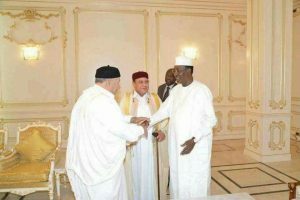 Members of the Warfala Reconciliation Social Council led by Mohamed Barguti were in the Chadian capital this week at his invitation to discuss relations between the two countries.